I am trying to improve my baking skills. As I have said before, I have had some issues baking cakes in the past, so I have tried my best to fix this... it is on the Life List you know. I recently went to Chef’s on Buckley and bought some frozen Blackberries. I thought they would be perfect for this recipe I found. It is really easy, so I thought I would share it with you. Empty the frozen blackberries into a sieve and thaw and drain the excess liquid. In a food processor, place the flour, salt and sugar and process until it is all combined. Then add the cold butter and process until the mix is like coarse sand (about 15 seconds). Pour 1/4 cup of water in a slow, steady stream until the dough just holds together when pinched. Add more water if you need to. Don't process for more than 30 seconds. Turn the dough onto a work surface and gather into a ball. Divide the dough in half and flatten each half into a disk. Cover these disks with plastic wrap and refrigerate for about 1 hour. After the dough is chilled, remove one portion from the fridge and place it a lightly floured surface. Roll the pastry out into a 30cm circle. Fold the dough in half and gently transfer to a 23c pie pan. Brush off any extra flour and trim any hanging pasty off the edge. Refrigerate the pastry and cover with plastic wrap while you make the filing. Preheat the oven to 200 degrees Celsius (425 F). Place the thawed and drained blackberries into a large bowl and add the lemon juice and toss it in. In a separate small bowl mix together corn flour/starch, sugar and ground cinnamon. Gently mix the sugar mixture into the blackberries. Remove the chilled pie crust from the fridge. 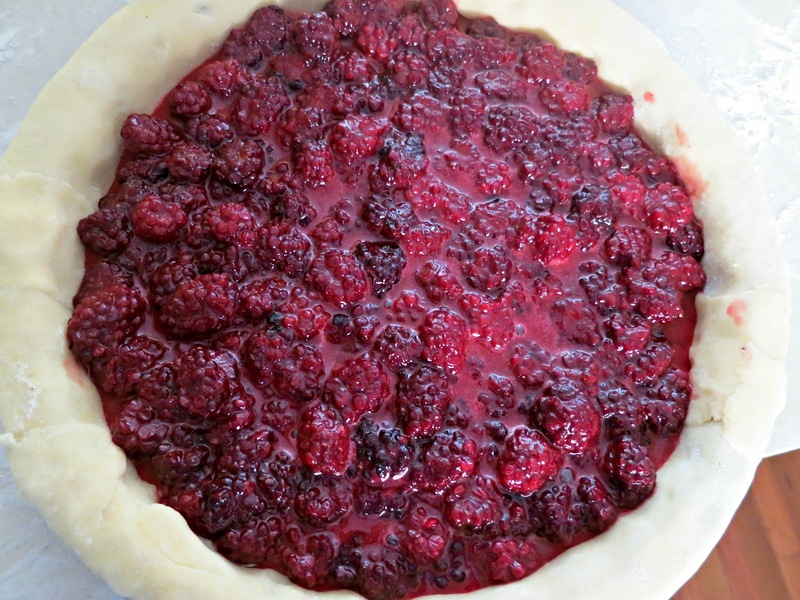 Pour the blackberry mixture into the pie tin. Remove the other portion of dough from the fridge and place it on a lightly floured surface. 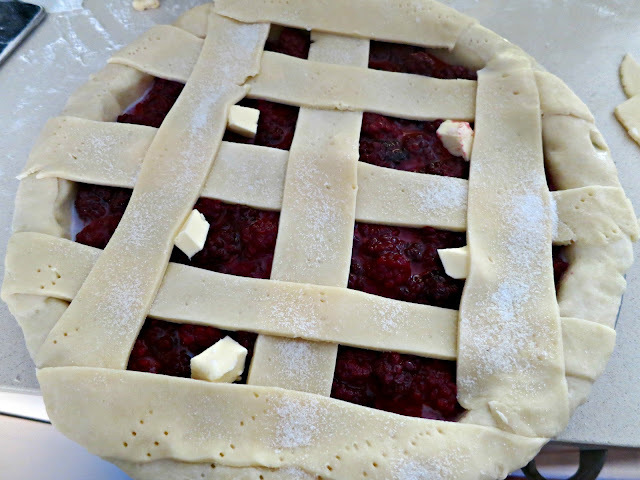 Roll the pastry out into a 30cm circle and cut into strips to create a lattice for your pie. Lightly brush the rim of the pastry with milk or cream. Place the pie into the over on the lower shelf for about 30 to 45 minutes until the crust is golden brown and the fruit juices begin to bubble. Place on a wire rack to cool for a few hours. Serve the pie with ice cream or whipped cream. As you know, this is not a food blog so unfortunately we ate the pie and then remembered I should have taken a photo of the finished result. That pie looks amazing. I have never made a pie with a lattice top. I did the same thing with forgetting to take a finished product pic with my latest post. It must mean our cooking is so good we forget to snap and just eat! Thanks for linking up. 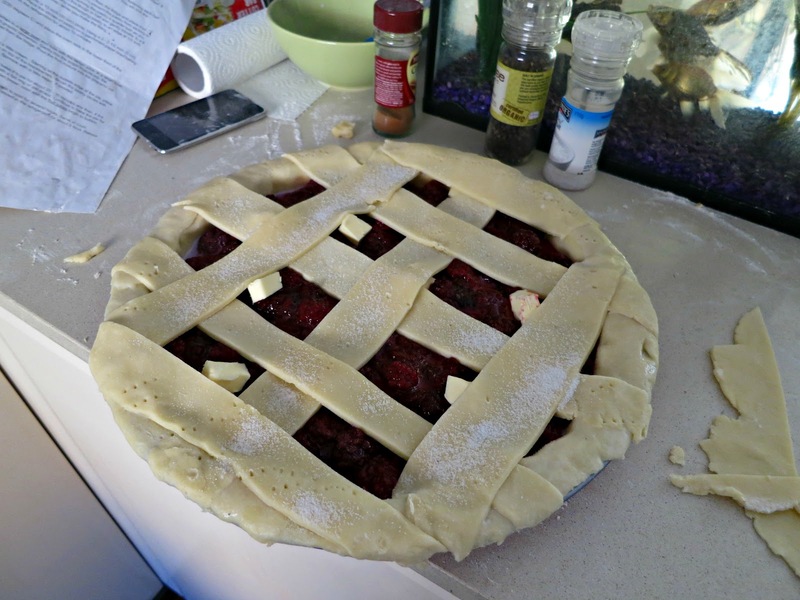 It is really nice and with the lattice it almost becomes a tart.